Since this is not a political blog, I am not going to get into the politics of the G20 taking place in China. Instead, I am going to comment on the body language of US President Obama and China’s leader Xi Jinping. The bottom line is that there was a lot of tension between the two. 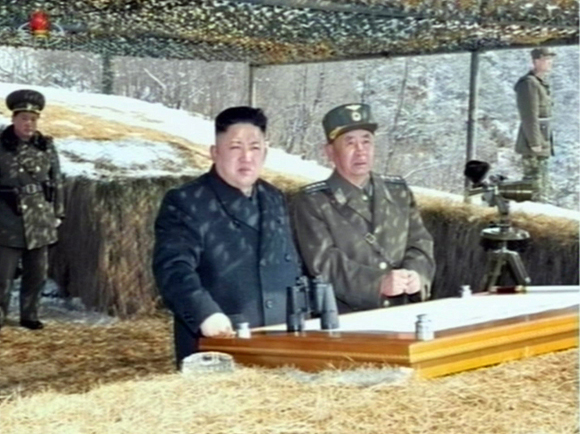 As you can see in the photo above, their their interaction was frosty..They are both giving one another the “cold shoulder”as both of them have their shoulders raised in relation to the other, Their bodies are also turned away from one another and there is tension in both of their mouths and in their lower law and jin indicating anger towards one another. Their photo op with a handshake was also very tense. Both of their lips are pursed and there was tension in their lower jaws. their bodies are turned away from one another. While Xi literally gives Obama the “cold shoulder” as you can see as he turns out with his body facing the camera. Obama attempts to turn his body towards Xi. 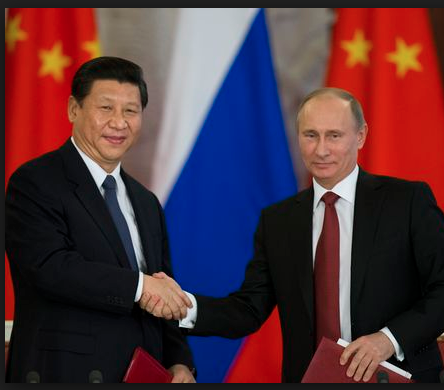 Xi’s thumb is on top as the two of them shake hands for the photo op. This is a demonstration of a power play where Xi appears to literally be on top and in control. In another pose where the two leaders are shaking hands for the camera, Xi’;s thumb is still on top of Obama’s as he seems to be the one tightly grasping on to Obama’s hand,.Obama shows anger here as his hand is balled into a fist as there is tension in the muscles in his hand. There is also a great deal of tension in Obama’s body as he appears stiff. While his shoulder is facing Xi, his head is also leaning towards Xi, but Xi’s head is leaning away from Obama which further indicates tension and perhaps even dislike towards Obama, as though he is repelled by Obama. The dislike is apparently not one sided as Obama feels the same way towards Xi. His facial expression says it all. as his eyes are tight and lips are pursed in a phony smile. The fact that they are both looking n different directions is also a signal of negativity between them. Xi also has a phony smile and is extremely stiff with tension as she stands next to Obama. One can actually feel the tension in this awkward moment between the two. When th When the two of them are sitting down next to one another, things do not fare much better. Obama has his arm covering his upper body which is a signal of defensiveness. The fact that his hand is curled up in a ball shows that he is also angry- angry and defensive when sitting next to Xi. Obama’s anger is also reflected in the tense muscles in his lower jaw. as he purses his lips. Xi does try to lighten up as he leans more in Obama’s direction in an attempt to be more engaging towards Obama. But the reality is that his true feelings towards Obama has leaked out through his pursed lips and tense smile. The bottom line is that they both appear to be very uncomfortable and even disturbed by one another. No matter how they try to appear cordial in front of camera, the body and face do not lie. In essence, there is no love lost between these two world leaders . When President Obama addressed a group of law enforcement agents and mentioned the tragedy in Munich, he was completely inappropriate and out of line. His smiling, joking and casual body language and bringing in his personal concerns about his daughter leaving for college, in the middle of what was supposed to be a somber moment shows his judgement is lacking and his mind is clearly elsewhere. No one in leadership or in any political position should act like that and bring their own concerns into the mix when discussing such as tragic and serious issue. This was a horrific incident where young children were massacred, yet he casually brings up his daughter leaving him to go to college as his own personal tragedy. He also made absolutely no sense when he spoke. He then looks down and says uh as you can clearly see that his mind is ready to go someplace else in this extemporaneous speech sans teleprompter. He then realizes he is being inappropriate and got off point as he laughs and with a big smile, holds his hand up and says Im sorry Im getting a little too personal as he scratches his nose. The nose scratching indicates that he knows what he just did was inappropriate. Then he says uh as he looks up in order to try to get back on track ,but he was completely off track, as what he said next made no sense. He was just talking about how we live our life of freedom, and then he got sidetracked with his own person issue of Malia leaving and then tries to continue where he left off but obviously forgot what he was previously talking about and and now suddenly talks about about it being up law enforcement. What is up to law enforcement? Is the personal freedom we have up to law enforcement or is it up to the Constitution? People had just been shot in Munich and he makes the above statement, which indicates that his heart wasn’t into what he was saying about what happened in Munich. It made no sense and shows his mind is clearly elsewhere. There was nothing funny about what he said and the laughter from the audience was no doubt nervous laughter, as they too knew how ridiculous it was to bring up his daughter leaving for college, mid sentence when he was supposed to address what happened in Germany. What he did spoke volumes about Obama’s state of mind in my view as is clear that leaving the Office of President cannot come soon enough for him. The Press got it completely wrong when they plastered a photo of Obama looking like he is making a peace sign at the Nuclear Security Summit. At first glance one would think that the President of the United States has lost it. They would think that gesture was completely inappropriate and unbecoming of a President, who appears to be the only one making such as gesture in the formal photo with other world leaders. But after watching the video of this photo session, you can clearly see that Obama was NOT making the peace sign. Instead he was letting the photographer know that two more people were coming. That is why he held up fingers. In fact his mouth was open in the photo, indicating that he was speaking.You can even see in the phot oabove that Obama is turning to someone ( like the photographer) and speaking to them. Then the press focuses in on the UK Prime Minister David Cameron a who looks like he is shooting Obama a dirty look. This is not the case as well. His facial expression does not show anger. he is simply looking to see who is missing from the photo based on what Obama said. There is no body language facial expression to indicate that he is angry or annoyed as the press mentioned. Likewise, there is no angry expression on Italy’s Prime Minister,Matteo Renzi’s face. Yet the press stated that he was angry with Obama as well. Then inside the meeting, the Press made it seem as though David Cameron was very angry at Obama. But if you examine the photo Obama is pointing his finger at someone to the side of Cameron and Cameron is not involved in that interaction. Cameron is merely looking ahead. His red face is not due to anger, but to some color he received while vacationing in Lazarote in the Canary islands. Cameron seems to be focused on what is ahead of him, not what is occurring to the side of him. This is why having an untrained journalist instead of a trained body language expert interpreting body language of world leaders can be dangerous. When US President Barack Obama wanted to put his arm around the shoulder of Cuba’s President Raul Castro, Castro was having none of it. 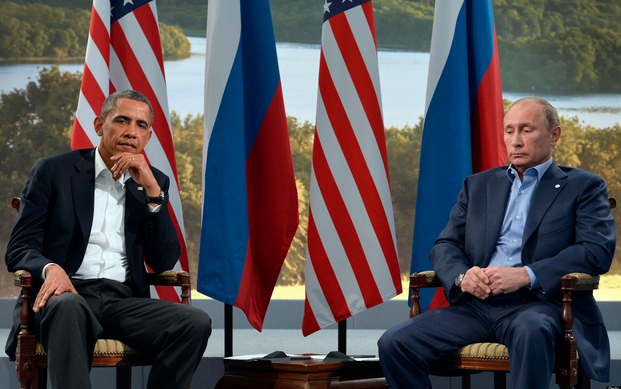 No matter what language you speak, the international language of “body language” speaks volumes. If Obama succeeded in placing his arm around Castro on Live Cuban TV, it would make Castro appear weak to his citizens. It would give the impression that Obama ( who is a head and shoulder taller than Castro) dominated the get-together and was more powerful than Castro. There is no question that Obama felt a little awkward or embarrassed by Castro’s rebuff. As you can see in the above photo, his head is bowed down as he waves. If he was feeling less awkward, his head would have been up while he was waving. His head would have been in the same upward posture as Castro, if Obama was feeling more confident in the situation. Obama is still touching Castro’s hand and Castro is ignoring him. Also Castro turns his body away from Obama which also speaks volumes as to how he really feels. Then Raul Castro takes charge. As Obama is still waving, Castro grabs Obama’s elbow, pinching him with his thumb as you can see. This is a sign of force as Castro directs Obama to leave the stage. Castro then extends his arm and continues his firm grasp on Obama’s arm, which is now at Obama’s side. He is in essence, trying to push Obama off the stage as Castro has now turned his own body towards the exit, while Obama is still standing there, with his body facing forward. Now Castro shows that he is definitely in charge and in control as the host of this meeting and as the President of his country. He walks past Obama, moving directly in front of Obama. Obama looks annoyed by this as you can see by the expression on his face. You can also see that Obama’s arm is at his side and hand is beginning to form into a ball which shows that he is angry at the situation. He is not walking erect with his head up, but his head is bowed down and his shoulders are hunched over which shows that he is not feeling very secure or confident about what has just occurred. So as far as a power play is concerned Raul Castro clearly showed Obama that he was in charge and in control and that Obama would have to take a secondary position to him. Even though the two world leaders, Benjamin Netanyahu and Barak Obama finally got together to meet after a year, there is still no love lost between them. Netanyahu was in the US to to discuss the nuclear deal with Iran and other regional conflicts, including the violence in Palestine. While it had been no secret that the prime minister of Israel and the President of the United States have had a strong disagreements in the past, their common thread is that they are both in favor of making sure Iran does not get a nuclear weapon. Another point of agreement is regarding the importance of dealing with violence. But in terms of their body language Obama still can’t seem to hide his disdain for Netanyahu ever since the Israeli Prime Minister accepted an invitation to speak, whereby Obama took the move as a personal affront by netanyahu and Republicans in Congress going around the White House to invite him to give a joint address to th Senate and the House of Representatives. Look at the photo above and you will see the tightness in Obama’s jaw signifying anger. He is pursing his lips as he looks at Netanyahu eye to eye. 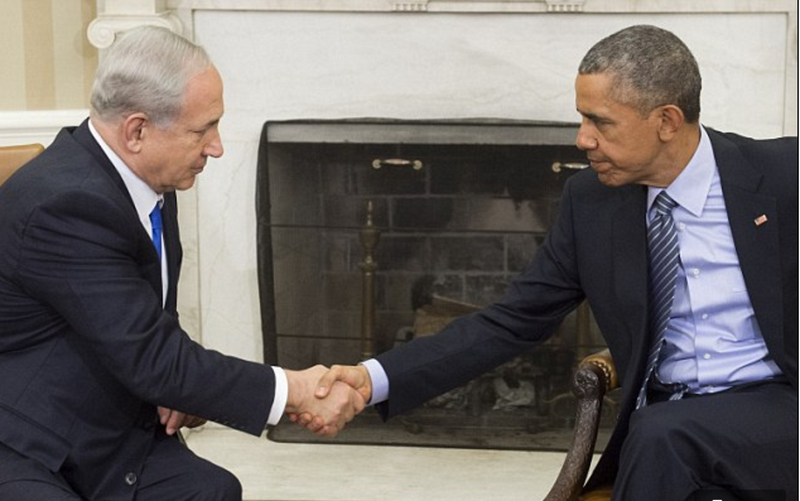 Obama slunches over when he reaches out to shake Netanyahu’s han. There also seems to be an aggressive power handshake with Obama as you can see his thumb deliberately pressing hard on Netanyahu’s hand. Netanyahu is also not pleased about Obama a you can see from the tension in his jaw and tight lips. Feet can tell a lot about how a person is feeling towards the other as well.In this case we see Obama’s legs are crossed and his foot and toes are positioned upwards. This means that he can’t wait to leave the meeting. This in in contrast to Netanyahu’s fet which are firmly planted on the ground.Also their feet are not pointing directly in one another’s direction which further indicates they don’t feel good about one another. Hands are also telling as both men are holding on to themselves in order to contain their true feelings. 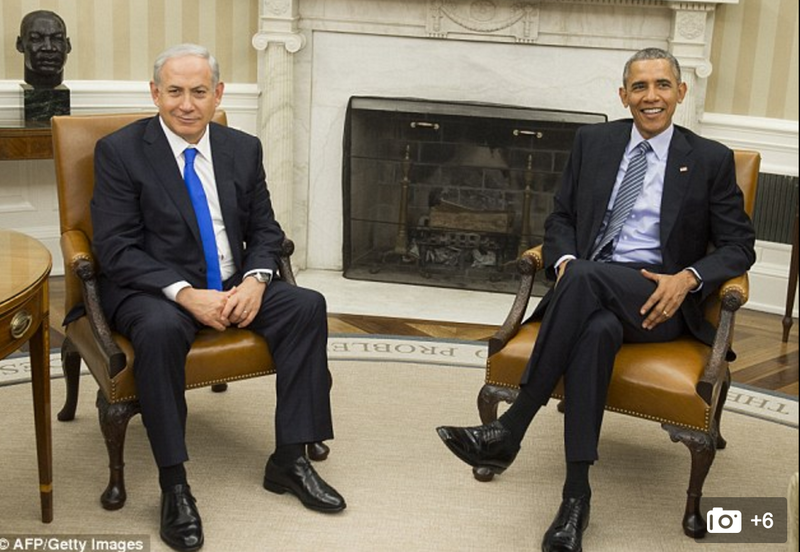 Netanyahu hold;s on to his fingers while Obama self comforts by olding on to his thighs. It shows how uncomfortable they are with one another. Another telling signal of their disdain towards one another is that their heads are completely turned away from one another. Netanyahu turns his head to the left and looks away from Obama while Obama looks straight ahead, not relating to Netanyahu’s presence. So even though the two allies – the US and Israel met to demonstrate their bond, there was definitely no bonding going on between the two leaders as you can see in this photo op. While President Obama may know a thing or two about politics, he knows very little about body language. In a recent speech he said that there was a lot of talk about body language of the two leaders when they met and warned the public not to read much into it because he said that Putin just has a slouching posture. Nothing could be further from the truth. 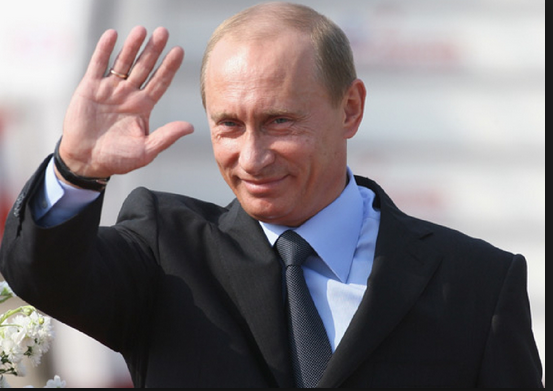 Putin is not a sloucher. In fact his posture is usually erect and reflects extreme self confidence. You consistently see his erect and straight posture when he speaks to world leaders. 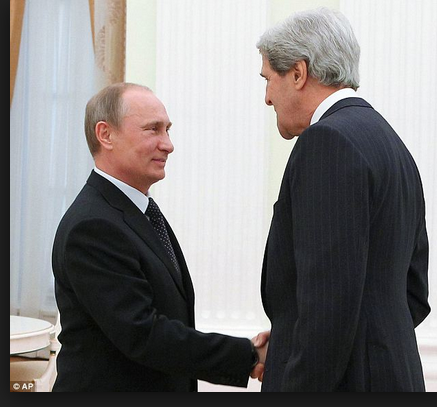 Here we see is non slouching erect posture with Secretary of State John Kerry. Here we see his erect posture with Chinese leader Xi Jinping. 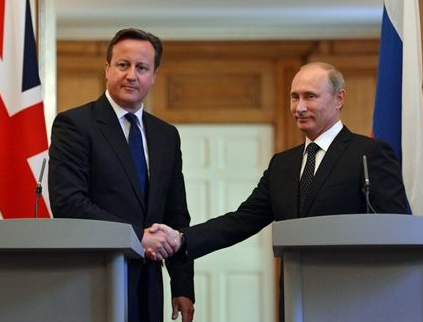 Here we see Putin’s non slouching erect posture with British Prime Minister David Cameron. But when Putin is near Obama his raised shoulders and fist like hand gesture indicates that he is angry at Obama and clearly doesn’t like him as he can’t even bear to look at him. He leans his body away from Obama as you can see and looks down as to avoid Obama entirely. Likewise Obama looks angry. In fact we have rarely if ever seen Obama with such a facial expression reflecting disdain. His hand is on his knee for self comfort and his facial expression speaks volumes. He puts his hand on his chin as he appears to be pondering what to do. There is tension in his face and cheek area indicating anger and the downward turn of his mouth shows unhappiness. 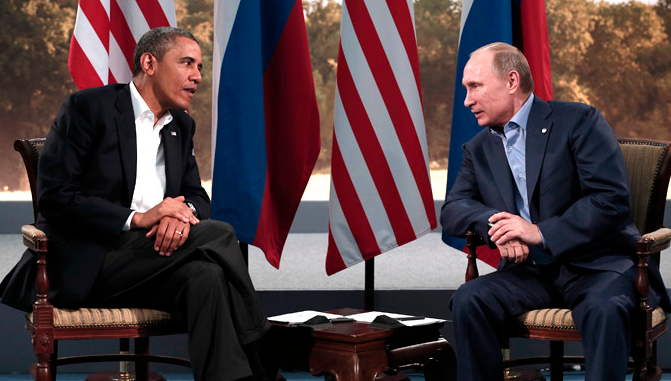 Obama is clearly not happy having to be in the presence of Putin. Here we see where they have an identical hand pose as those they are holding on to themselves and restraining themselves from all the anger and disdain they have towards one another. 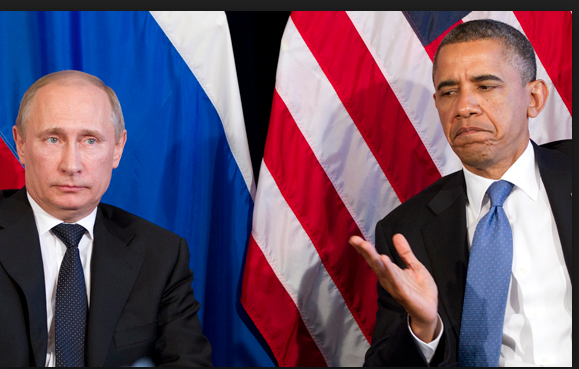 Putin cannot even establish eye contact with Obama as he looks away while Obama looks at him with a skeptical facial expression. There is clearly no love lost between these two leaders.There is mutual anger and mutual disdain for one another body language wise and facial language wise no matter what pleasant words they use about one another. While Kim Jung Un is trying to come across as a world tyrant threatening to annihilate the world with a nuclear attack, it is clear from his body language that the young man is deathly afraid. As an educated man he clearly knows the outcome of such an attack on his country and deep down, I wonder if it is him behind all of the sabre rattling or his father’s old guards. After looking at photos of him with his guard of officers from his father’s regime, one cannot stop to wonder if he is a mere puppet of his own government and being controlled by four specific military officers who never leave his side. In the photo above the to men to the right and left of him seem to have a strong hold on him even physically. 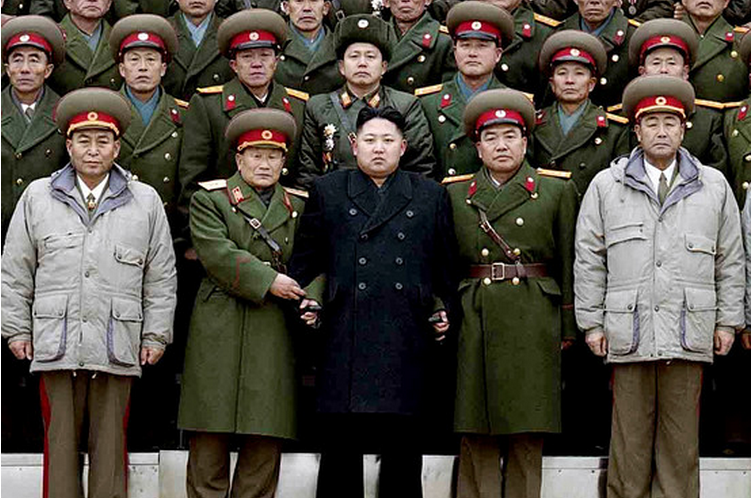 Look how the man on the immediate right had both hand’s interlocking Kim Jung Un’s hand. In this photo he is to the right of Kim Jung Un. 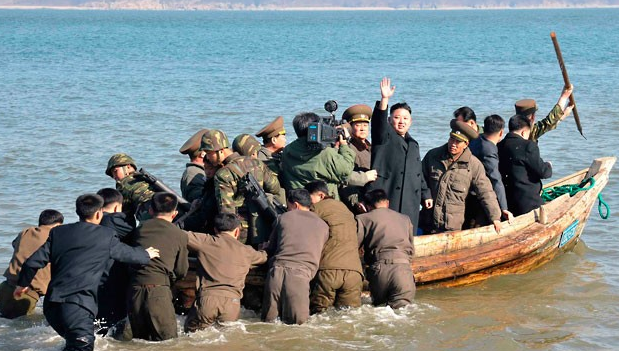 Note his extremely erect and confident posture as compared to everyone else on the boat. Note how the leader is the only one smiling as he is propped up by older gentlemen who were clearly a part of his fathers regime. This is the third photo where you can see him being physically handled or manipulated by others in his camp. Go back and look at the initial photo in this blog. 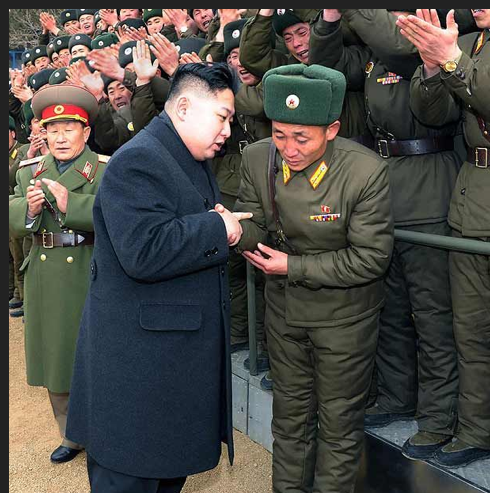 The man in the light colored jacket to Kim Jung Un’s far left. surfaces again. Here he is leaning into Kim Jung Un shoulder to shoulder. It is very unusual for and leader’s underlings to be that physically close to a leader unless they are trying to control and manipulate them. And look who is lurking in the background making sure things move smoothly. It looks like the man in photo 3 who is at Kim Jung Un’s far left. 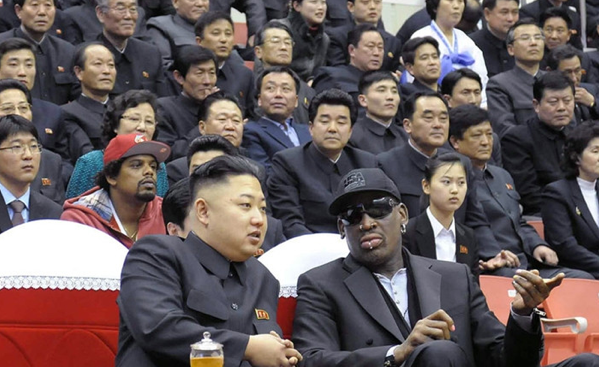 These minders even show up when Kim Jung Un is having a good time like hanging out with for Chicago Bulls basketball player Dennis Rodman. Look at the third row. There is a man sitting next to a woman. 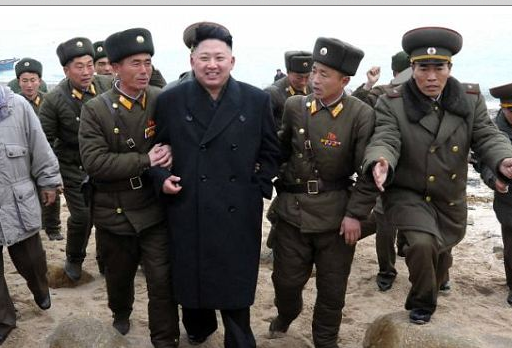 That heavy lidded man is the same man in photo 1 to Kim Jung Un’s far right. . 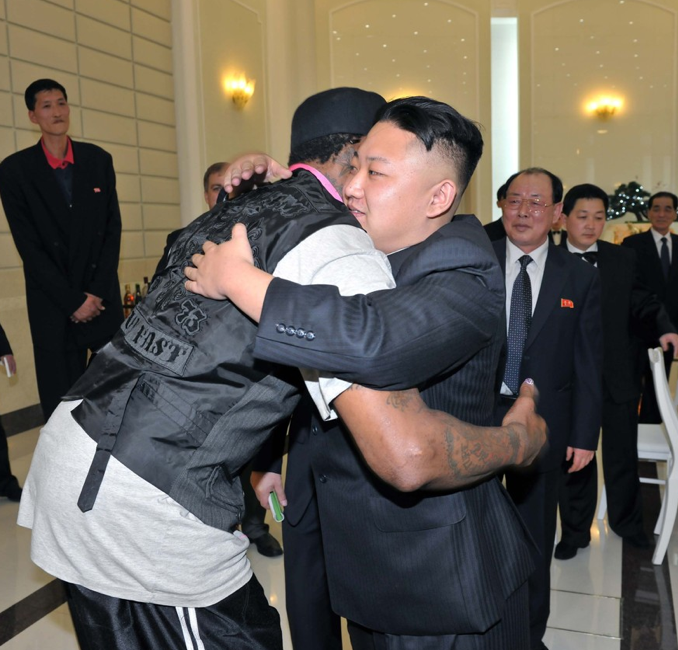 The “leader” seems very relaxed facially as we see him with Dennis Rodman. He also likes Dennis a lot as he leans into him. He hugs Dennis with both hands and smiles as he lets his emotional curtain down. It is quite a contrast to his body language around his minders, at least facially. 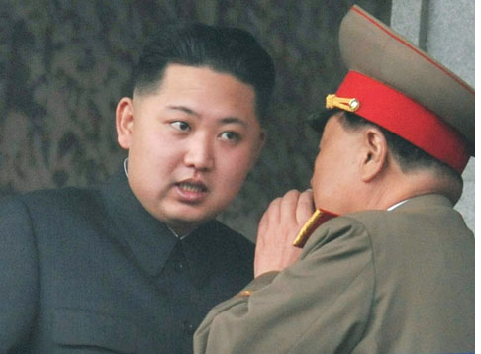 This leads me to question whether Kim Jung Un is a mere puppet for his father’s regime. While his father Kim Jun Il certainly knew how to push the envelope on the world stage. He also knew when to back off. He was clearly in control as was his father who previously ran the country. But now there seems to be more aggression and more hostility. Is this coming from Kim Jung Un or the military men around him who are clearly controlling his every move based on thee body language observations. So these old men may look at it as their turn to take charge now that Kim Jung Il is dead. Are they doing it though Kim Jun Il’s inexperienced and frightened son? To make sure this is the case Dennis Rodman may come in handy . Since Rodman’s visit with the leader, he spoke to the press and told the press how much he liked Kim Jung Un and how he would consider him a friend. Perhaps Dennis can visit his friend again and this time observe what is really going on behind the scenes and report it to diplomats. Perhaps he can even reciprocate and invite the leader to the US to see a basketball game. But most likely his handlers would nix the idea. if they do, this will be a great insight as to who is really in charge. With all the rhetoric of war and attacks surfacing, seeing the same serious faced uniformed men around this 29 year old makes one wonder whether he is really in control or whether he is merely a puppet being manipulated by the old guard. Perhaps his own life is in jeopardy as well.Perhaps he knows what will happen to him if he doesn’t do as they wish. Kim Jung Un apparently grew up in Switzerland and is highly educated. He very well knows that war could be the end of him and his country despite the bravado and comical propaganda tapes against the West which have recently surfaced. These tapes show a lot of soldiers marching and bombs going off as they tell how they are going to annihilate the West and South Korea. The tapes also show how poor America is with it’s inhabitants having nothing to eat but snow. Because of his awareness of the outside world, there is no way Kim Jung Un could possibly believe this. He may be a prisoner in his own land with the real powers that be most likely manipulating his every move. This makes things even more scary between North Korea and the world. These old men from his father’s regime who are not worldly and who have nothing to lose may think nothing of trying to blow up South Korea and other parts of the world. Besides lots of prayer, Dennis Rodman may be the answer. In his interviews he mentioned that Kim Jung Un wanted President Obama to call him. But there is hesitation because things at this level need to go through proper diplomatic channels. I say, forget the formality and the proper protocol and rules. I believe President Obama needs to call him and invite him here and talk some sense into him. Kim Jung Il needs to be away from his minders. Perhaps world peace could be achieved on a basketball court at the White House with Obama, Kim Jung Un, and Dennis Rodman playing on the same team.